Rocky Mountain Rock Fireplaces . . . Lodges, Logs & Luxury! stone hearths were crafted from the mighty timber and stones found along their rugged slopes . . . . .
A microcosm of the majesty and grandeur of the mountains from which they arise, western rock fireplace designs tend to be monumental in scale. From the booming Industrial Revolution of the 19th century emerged a rapidly rising middle class. No longer the exclusive domain of the wealthy, travel and leisure -- spurred on by the rapid expansion of the railroads -- was available to nearly everyone. tions and service found within! 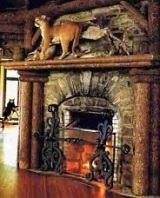 stone fireplace, pictured below, the more recent photo beneath it is nearly identical in appearance. state New York, it travelled westward and mingled with other architectural styles to form a distinctive regional variation. place is an absolute "necessity!" tured below are outstanding examples of present-day incarnations of rustic resort fireplaces of yesteryear. Framed by massive peeled logs, they harken back to the heyday of grand mountain lodges! As with the examples above, the two striking designs pictured below are also of relatively recent origin. The rugged hearth below, left, is crafted from huge blocks of cut granite. Below, right, large cut stones extend from the fireplace facing to form a cozy inglenook! And finally . . . . . . . few rustic stone hearth designs exude the period ambiance of the stunning rock fireplace pictured below. Complete with a rustic log mantel shelf, this present-day example simply oozes nostalgic charm! Please check back often or subscribe to our RSS feed, as we fre- quently add new rock fireplace designs to our site. The Spirit Of The Old West Lives On! The Old West Was Never THIS Luxurious!